If you're eyeing an OCPJP or OCAJP certification in the future, here are some hints from a fellow Java dev who has passed them. Java certification is highly regarded in the IT Industry and provides a Java developer with recognition worldwide. It helps to find a better job, get a better salary, and even a better raise or bonus at a current job. That's why thousands of Java developers try to become certified every year, but success is not easy. Oracle's Java Certification has a tough passing percentage, close to 65% for both OCAJP (the Oracle Certified Associate Java Programmer) and OCPJP (the Oracle Certified Professional Java Programmer). You need in-depth knowledge of the Java language and API to succeed in the exam. As a note, preparing for OCPJP is not very different from OCAJP, though you have to use resources that are focused only on OCPJP. You also need to cover more topics and more in-depth because OCPJP 8 is certainly a tough nut to crack. In order to prepare well and get a high score, here are some tips I am going to share. These tips have helped me in the past to score more than 90% on the certifications. So, without wasting any more time, here are my five tips to prepare well for the OCAJP and OCPJP exams. There is no better way to prepare for Oracle's Java certification than joining a good course. First of all, it's active learning and you learn 80% of important things in just 20% of your time. I was a big fan of the book and I am still is but in last a few years, online courses have my main source of learning anything. One reason of that is cost, in recent years, mostly dude to Udemy, cost of online courses has come down a lot and some of the courses are even cheaper than books the key is to find a good course otherwise you would waste your time on course hopping. When it comes to Oracle's Java certification like OCAJP and OCPJP, Whizlab's OCAJP training course is my favorite. It provides the most comprehensive coverage and given their experience in the area, you can rest assured of quality. There is also more than 50% discount available on this course for you. There is no better companion than a good study book if you are preparing for Java certifications. They cover all the exam topics, give practice questions at the end of the chapter, and share a lot of exam-specific tips that you don't find in any normal Java book. There are a lot of study guides available in the market, but if you are preparing for OCAJP 7 or OCAJP 8 you can take a look at these resources to find a good study guide. After choosing a good book or study guide, the next thing you need is a good exam simulator. This is must if you want to score high but not required if you just aim for passing the exam. The exam simulators will help you to develop speed and accuracy required to complete all questions in 2.5 hours. These are the best in the market, tried and tested by many developers including myself. If you need to go the extra mile with your preparation, I suggest you solve the 450+ problems from David Mayer’s Test. Btw, if you are buying Whizlab’s simulator then you can also use the coupon code “JAVACOMBO2” to get a 25% discount. Since they provide lifetime access to their simulator, I suggest you buy both OCAJP and OCPJP simulator together and take advantage of this coupon code. You have to keep yourself motivated and up to date on the exam and other details. With that in mind, there is nothing better than participating in forums like CodeRanch or Oracle's official Java Certification forum. You can ask questions, clear doubts, and become familiar with other candidates who are preparing for exams. You may be able to find some buddies as well who can prepare with you for exams. There are many such free exams available and Google is your friend. You can find a lot of them to get started with. There is no substitute for coding. You must code daily to develop a coding sense, which will help you to read the code given in the real exam. In the case of OCPJP, it becomes even more important because attention to detail is required to understand each coding question before you select options. All the best for your Java certifications. 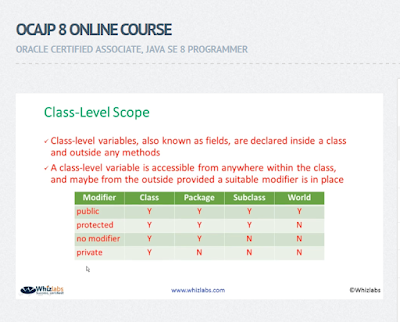 Make it a goal this year, and you will surely be a Java SE 8 Certified Programmer in next year. P.S. — If you need some FREE resources, you can check out this list of free OCAJP 8 and OCPJP 8 mock exams to start your preparation.